MD METALS & Manufacturing Limited has been manufacturing filter vessels & pressure tanks for the last 15 years. We provide an extensive range of cartridge and bag filter housings to meet your requirements. Should it be necessary, we can provide design and detailed CAD drawings, we have coded welders to produce the required quality and can manufacture vessels in short lead times. The Company is privately owned and is based in the Manchester area. We manufacture vessels for all types of industries such as water, oil, chemicals, paint etc. We use PD5500 for our manufacturing standard and P.E.D. for our inspection and quality requirements. Our welders are qualified to weld to ASME VIII and BS287 & 288. 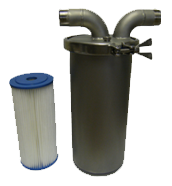 Cartridge filter vessels offer a wide range of flow capacities and contaminant holding capabilities. The housings can accommodate from 1 to 116 cartridges around. All housings can be supplied with a CE mark if required..
Our bag filter vessels offer a wide range of flow capacities and contaminant holding capabilities. The range is available at a 16 bar g pressure rating and may be CE marked if necessary..